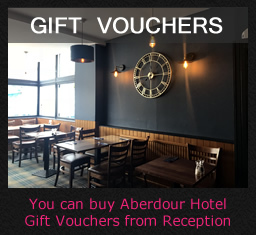 The Aberdour Hotel's location offers quick and easy access to a wealth of golfing opportunities in and around Fife, not least the magnetic draw of historic St. Andrews, which needs no further introduction. Golfing in Fife has, however, a life well beyond St Andrews. Of Scotland's over 500 challenging, scenic and welcoming courses, 50 of them are within an hour's drive of the hotel. 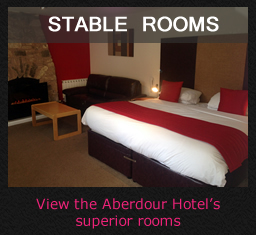 The variety of courses available in Fife makes the Aberdour Hotel an ideal base for a golfing trip or holiday golf destination. A magnificent array of links and parkland courses await you: Lundin and Leven Links, Burntisland, Deer Park, Ladybank, Elie, Dalmahoy and Kirkcaldy. 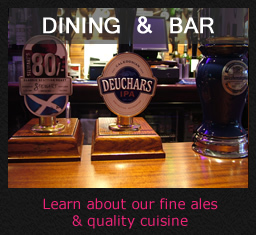 We particularly recommend our own course - Aberdour Golf Club. Remember too that we are close to the famous Carnoustie Golf Club and the Open Golf Qualifying courses at Downfield, Panmure and Monifieth. The long hours of daylight in Scotland are an added bonus making two rounds a day possible for an extended period during the summer months. 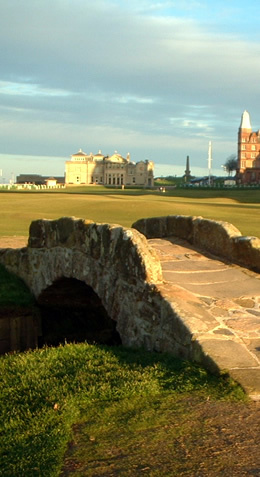 As an alternative to a second round of golf why not visit some of the many tourist attractions in Fife or mix the excellent golf with some great fishing or other outdoor adventure that we can arrange for you. First in Fife offers the chance to play at 13 Fife Golf Courses from as little as £21 per round. Golf passes can be purchased directly from their website and can be used anytime from 1st April to 31st October.